"Dark-chii.net has a nice framed layout, but remains too static with its presentation. But within the site there are some nice items that are unique to this site of which the highlight for me was the picture gallery. There are just so many little promotional items for Chobits that it is hard to collect them all, but this site does a good job of collecting most of the main ones. There's also a mp3 page with some of the key songs available for download. The music might not appeal to everyone, but it's worth checking out. My only suggestion would be for the webmaster to add some more stuff to the site. The anime and manga sections could use some info that actually explains what the show is about." "Being a design freak, the first thing that crossed my mind visiting this site is, of course, its layout. "Simple" is the operative word with this one, folks. Maybe too simple. I'd like to see more effort put towards the thumbnail pages and links to the sub-sections made more apparent. Apart from those small niggles, this site is a neat and tidy little tribute to another one of CLAMP's masterpieces. The picture gallery has a sturdy collection of images, and the manga/anime/soundtrack/dvd info is more than enough to keep the average Chobits fan "in the know," as they say. All in all, a solid, friendly fansite experience!" 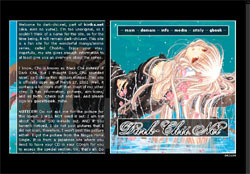 "Darkchii.net is a cute little Chobits site, very compact and tight with a simple design that loads quickly. At times, the design seems almost TOO simple, but the content is pretty solid. Nice amount of media available, the scans and music downloads are a really nice touch. This site is notable for it's quality content, but it also has a nice amount of information. Unfortunately, the release information seems to only pertain to Japanese releases, but the episode listing and seiyuu information is nice. This is a simple fansite with a lot of merit, very nice!"